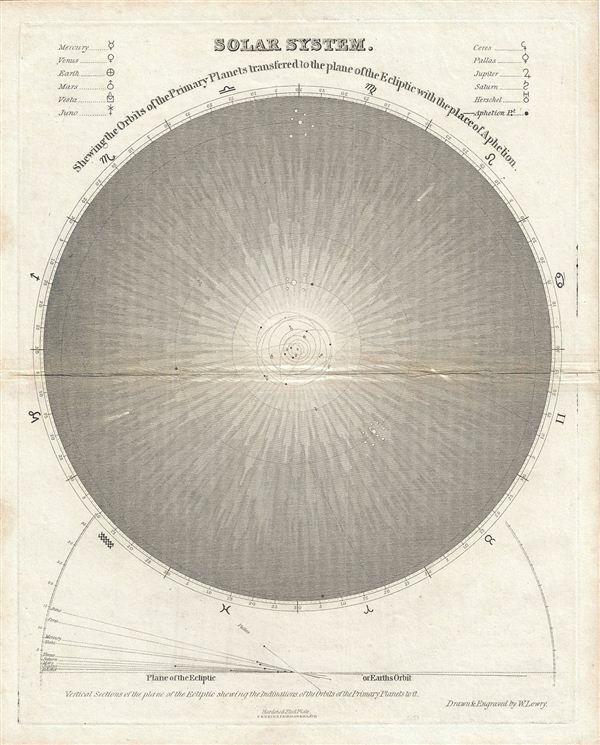 This is a fine example of W. Lowery's c. 1840 Lowry map of the Solar System. The map shows the orbit of the primary planets transferred to the plane of the ecliptic with the place of aphelion. The upper left and right quadrant contains a key identifying the planets from Mercury to Uranus. At the time Uranus was known as Herschel, after its discoverer William Herschel, one of the greatest astronomers of all time. The map also identifies four large asteroids, viz. Ceres (1 Ceres, the dwarf planet and largest asteroid in the solar system discovered in 1801), Pallas (2 Pallas, discovered in 1802), Juno (3 Juno, discovered in 1804) and Vesta (4 Vesta, discovered in 1807). The map bottom features 'Vertical sections of the plane of the ecliptic shewing the indinations of the orbits of the primary planets to it.' This map was drawn and engraved by W. Lowry and published by Perrins Fairman & Heath. Very good. Original platemark visible. Blank on verso. Typical wear on original centerfold.